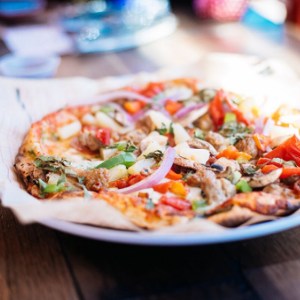 Conveniently located Chess Drive near Petco, MOD Foster City serves up personal-size artisan-style pizzas and salads for lunch and dinner. Everything’s made fresh on demand in just minutes – choose your own toppings for a completely custom pizza or salad. There’s even pizza salad if you can’t decide. Come visit MOD Pizza today and see what our MOD Squad can make for you! We support local schools and nonprofits through fundraisers and donations all year, along with our annual Spreading MODness campaign in November. Our Foster City MOD has partnered with Fresh Lifelines for Youth (FLY), an award-winning non-profit dedicated to breaking the cycle of violence, crime & incarceration of teens in Santa Clara, San Mateo & Alameda counties. Find out how MOD can support your organization or charity here.